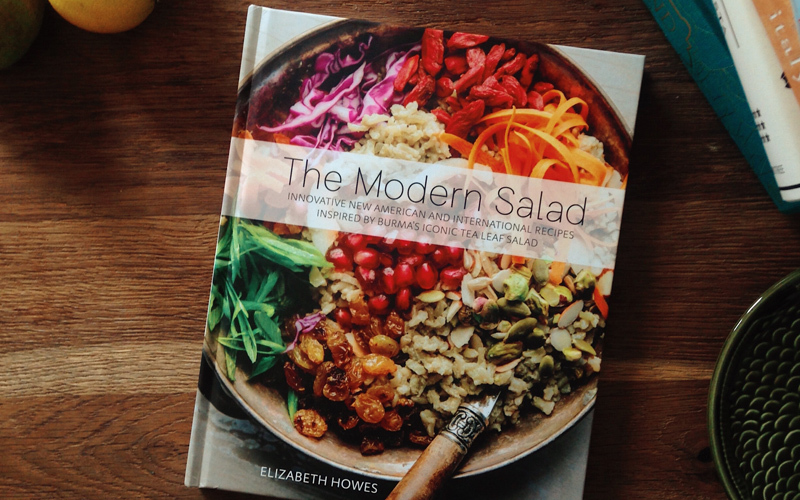 I was mulling over a starter salad for a lunch party recently when my colleague handed me a book, titled “The Modern Salad” by Elizabeth Howes which he chanced upon in the library. It’s a wonderful salad recipe book inspired by Burma’s iconic tea leaf salad that speaks to me on multiple levels. The ‘tea’ word is dead giveaway. Second, the recipes straddles eastern and western culinary sources from Burma, Japan, India, Middle East, Mediterranean and others. I love these inspirations as they mirror my own hodgepodge background. Plus Elizabeth’s journey to the culinary world is similar to my own to the tea world; she gave up a lucrative career in technology industry to pursue her dreams in food. My team had been conversing with Elizabeth across the ocean and I’d love to introduce this jewel of a recipe book in this blog. Based in San Francisco, Elizabeth is a chef, author, and flavor profiler with a focus on creative, healthy and flavourful ingredients. One of her most memorable kitchen moments was lacerating her finger on US national tv while attempting to complete a knife skills challenge by Iron Chef Masaharu Morimoto. This one of many trainings, plus life experiences coupled with self experimentation shape her into the chef she is today. When not writing or experimenting in the kitchen, she helps culinary brands develop innovative signature flavour profiles based on trending New American and international flavours. Like a modernist architect that advocates form follows function, she’s completing her Master Science, Health and Nutrition Education to bridge the gap between the foundation of food (form) and how it affects our bodies at the cellular level to support well-being (function). Inspired by Burmese culture, this book is her ode to a resilient people at a crossroad of contradictions: modernity and antiquity, democracy and military rule, freedom and oppression. Their relationship with food, and the ritual of gathering around a table to cultivate community, serves as a sanctuary from daily strife. Thus, she set off in an expedition of whimsical curiosity in pursuit of those contradictions expressed through their food: tart and sweet, salty and bitter, crunchy and tender, spicy and cool, fresh and cooked. Combined, these elements make the tea leaf salad unforgettable. Featured here are two recipes with one of Burmese’s national dishes, the tea leaf salad. Once reserved for royalty and served only during special occasions because of the prized ingredients, this salad called lahpet thoke is enjoyed by many. Unique ingredients such as bazun-chauk (sun-dried, briny ground shrimp) breathe life and balance into this salad, plus the coveted savory umami flavor. Fried beans or peas provide crunch and pop that makes eating this salad a lively experience. I believe Elizabeth had simplified the recipe to make it easy for home preparation, at least for people who don’t live in Burma (current Myanmar). Fermented tea leaves blended by hand. Get a copy and see more of The Modern Salad book here. Soak tea leaves in hot water for 10 to 15 minutes until leaves expand and soften. Drain and sort out stems and rough pieces. Squeeze remaining liquid and return leaves to bowl, filled with lukewarm water. Mesh the leaves with hands. Let meshed leaves soaked in cold water overnight to remove remaining tannic and bitter notes. Next morning, drain and squeeze to remove excess water. Combine remaining ingredients into food processor until a paste forms. Add to meshed tea leaves and combine with hands. Transfer mixture into glass jar, pressing the mixture to remove air bubbles. Cover tightly and store in cool, dark pantry for 2 to 3 days to ferment, turning upside down a couple of times to evenly distribute the liquid. Put jar in refrigerator until ready to use, where it will remain fresh for up to a month. Drain excess water from fermented tea leaves. Assemble ingredients on a large plate. Add the desired amount of tea leaves, drizzle garlic oil and fish sauce over salad. Combine mixture and add salt to taste.